Science Selective Rat Dry is a nutritionally complete and balanced diet that has been developed for rats to help them healthy and well. Specially formulated to help keep your pet's skin and coat in great condition, the food also includes fruits such as apples and blackcurrants for their antioxidant properties, and a high vitamin content to promote optimum health. Science Selective Rat is also high in polyunsaturated fatty acids and low in both saturated fatty acids and cholesterol to assist cardiovascular and circulatory health. 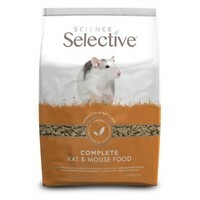 My rats like this product better than any of the muesli mixes, which is great, because it means there's no selective eating. I also like that the ingredients are very good - no animal/vegetable derivatives.